Prominent among my many childhood memories are those of the hikes I took with my father along various sets of railroad tracks. These walks occurred when I was between nine and twelve years old, and were usually around ten miles in length. My mother would drop us off somewhere, we’d walk to some convenient point, and then she’d pick us up. On one of these walks, likely around 1982 or ’83, we walked the remaining length of the Stillwater and St. Paul railroad, starting in downtown Stillwater. Upon hearing last Fall that those tracks would finally be removed, I thought it would be a good idea to revisit that walk, and photograph the line. Once the tracks are removed, those scenes will never be the same again. I recruited my friend Tim, who grew up watching trains on the line, to join me. The Stillwater and St. Paul railroad was built in late 1870; regular service started in 1871. It was truly one of the pioneering railroads in the state. It started in Stillwater and terminated in White Bear Lake, where it connected with the Lake Superior and Mississippi Railroad, giving Stillwater rail connections to both St. Paul and Duluth. When the Minneapolis and Duluth reached White Bear Lake in mid-1871, Minneapolitans could ride a train directly to Stillwater, completely bypassing St. Paul. The Lake Superior and Mississippi quickly leased the line, as it afforded connections between Stillwater’s grain terminal and those controlled by LS&M; in Duluth. The LS&M; collapsed, along with many other parts of the economy, in the Panic of 1873, but by 1877, it had been reorganized as the St. Paul and Duluth Railroad. The St. Paul and Duluth railroad did not formally acquire the Stillwater line until 1899; in 1900, the St. Paul and Duluth was officially absorbed into the Northern Pacific Railway, and the Stillwater and St. Paul was thereafter a small branch of a very large system. Over the next 80 years, the diminished logging industry gave way to heavy industry along the shores of the St. Croix, which then, too, began to fade. In 1970, the Northern Pacific was a part of the giant Burlington Northern merger. This merger, envisioned by James J. Hill back around the turn of the century, was very much about the scrapping of redundant and under-utilized lines. The Stillwater branch became a target for abandonment, along with most of the other Northern Pacific branches in Minnesota. It enjoyed some new life over speculation that BN might win the coal delivery contract for the Allen S. King power plant in Bayport, but this didn’t happen, and by 1982, the line was abandoned from White Bear Lake to a few hundred feet west of a place called Duluth Junction, which was the location of the crossing over the original Wisconsin Central line, now better known as the Gateway Trail. The abandoned portion of the line quickly vanished back into the hands of private property owners, and BN started accessing its Stillwater yard via trackage rights over the Chicago & North Western’s branch from Hudson that entered Stillwater from the south. Meanwhile, the Minnesota Transportation Museum was on the hunt for a place to operate their steam train, powered by the former Northern Pacific #328. This engine had spent most of its more than forty year career on the various branch lines of the old St. Paul and Duluth, including the Stillwater and St. Paul, and, due to the work of a forerunner to the Museum – the Minnesota Railfans Association – 328 was saved from the scrapper in 1950 and put on display on Stillwater’s riverfront. When the museum completed a five year restoration of 328 in 1981, they ran her on various lines around the Twin Cities, but they wanted to find a more permanent home. In July 1983, the Burlington Northern gave them one by donating the remains of the Stillwater and St. Paul, with only a few operational caveats attached. After much back-breaking track work, mostly by volunteer labor, the line was put back into service and was frequently used throughout the 80s by the museum and its train. A read through the museum’s publications from the time show high optimism at their development of their own railroad. Unfortunately, though, the more rural areas of Washington County were seeing more and more residential development as the 80s went on, and subdivisions started butting up against the museum’s operations. Many of the line’s new neighbors objected to having train operations in the vicinity of their homes. Some were even angry enough about it that there were evidently multiple occurrences of verbal confrontation between the museum’s members and these residents while work was being done on the tracks. After all, steam engines, for all their old-time romance, are noisy, dirty, smelly creatures. Noise and pollution, aside from simple economics, were key reasons for their going extinct. I suppose few people alive now really understand how much of a nuisance steam engines were in daily life, but those people in Washington County probably got some idea of it during the Museum’s weekend operations. Finally, facing increasing threats of litigation, the museum sought to compromise with the community as to the scope and timing of its operations, but, by 1991, the more vocal of the critics succeeded in getting an ordinance passed that would essentially destroy the economics of the line for the museum. Happily, though, at the same time that this was unfolding, historical preservation folks in Osceola, WI had been working on preserving their Soo Line depot, and they approached the museum about moving their operations to that line. A flurry of discussion with that group and the owner of the line through Osceola resulted in an operating agreement that started in 1992 which continues to this day. Meanwhile, the Washington County NIMBYs were not as upset with the operation of the Minnesota Zephyr dinner train, which was much more low key, and so in 1993, the museum sold the line to the owner of the Zephyr on a contract for deed, using the annual revenues from the sale to finance their other operations. By the late 2000s, the owner of the Zephyr decided to retire, and in lieu of a buyer, finally shut down the train in late 2008. The Zephyr train equipment currently sits, looking rather forlorn, near the faux depot that served as a point of embarkation for the train’s customers. As a part of the deal that ended the 2011 Minnesota government shutdown, the DNR will acquire the property, remove the tracks, and put in a bike trail from Duluth Jct. to downtown Stillwater, thus finally providing a Stillwater connection to the popular Gateway Trail. But they’ll remove more than the tracks: the bridges will be made “safe”, if not completely replaced, and any trace of railroad accessory will probably be removed, and in their place will be tasteful trail-side interpretive displays that will try to recapture the reasons for the corridor’s existence. We began our walk in Downtown Stillwater. The yard persisted well into the 2000s, even though its only connection to live rail, via the former Omaha branch from Hudson, had been been long severed by a washout south of town. The city had a great need for parking, and convinced the BN to abandon the property. 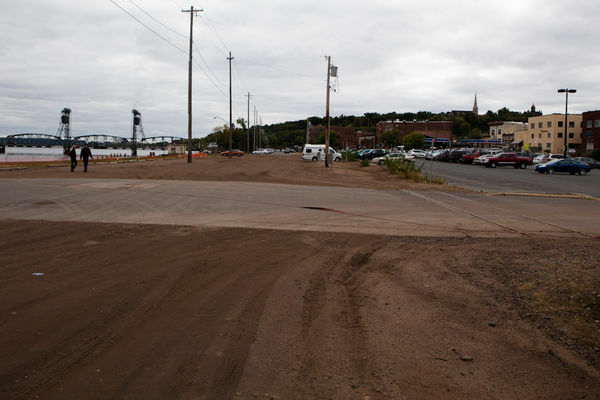 Directly north of the yard, the right-of-way now serves as a back access road to the marina. The “historic” Stillwater depot. Nothing historic about it, really. It was built by the owner of the Minnesota Zephyr. As we approached the Zephyr equipment, I noted that something had changed with the long-parked train. It has two engines, and for many years, they ran it with an engine on each end. I was certain that I had seen the rear-facing engine only weeks before. Now, scores in the pavement suggested it had been dragged away, possibly to be loaded on a truck. The place definitely has the look and feel of something that has simply been left to the elements for a few years. Aha, the rear-facing engine was not missing at all, it had been moved next to its sibling. As we walked past the engines, it was clear that something had recently polished the rails. Our conjecture was that perhaps the whole train had been pulled forward, the rear-facing engine placed on the siding, the rest of the train put back to where it was, and then the rear-facing engine was joined with its counterpart, and that during the move, the train had been accidentally shoved off the end of the track. Heading north out of the station, we saw that the surrounding nature is definitely starting to close in, but the tracks are still mostly walkable. After this point, though, the way was reduced to a well-traveled foot path. I would really like to believe that this sign dates back to the Northern Pacific era. It certainly isn’t the kind of sign the Burlington Northern would have put up. I have memories of it being there in the 80s, but the realities of a wooden sign being exposed to the elements for possibly more than 50 years makes me lean toward the possibility that the Museum put it up as a very accurate replacement. I don’t think there’s any question that the _ location_ of this sign isn’t original, however: On Google Earth, the sign is recognizable by a single white pixel; a trace of the line for a mile past that point toward town gives an endpoint of exactly the site of the former Union Depot. Explanation: At this point, the line is starting its climb out of the valley. On the other side of these trees, down the embankment, is a house with an elaborate outdoor swimming pool. It looked to us like this line of young pine trees had been planted in a bid to build a “natural” fence to protect the pool from future gawking cyclists. The climb continues, and curves up to the bridge over Highway 95. The bridge itself also has some mystery attached to it. Both of us had understood that it was actually a repurposed turntable from some local roundhouse, probably in Stillwater. I’ve found no evidence in print to suggest that, and indeed,the “split” nature of the bridge suggests that if it actually was originally a turntable, then it must have been dismantled and reconstructed. The turntable idea, therefore, was probably misinformation. The first image below is a good juxtaposition of the old vs. the new (drab) housing that has filled the area. According to the old plat maps of the area, at this point the width of the right-of-way increased from 75 feet to 100 feet. The line then turns due west and follows a twisting path out of the valley through Brown’s Creek Ravine. These couple of miles had grades in excess of 1.6%, with a small piece of 2.2% toward the top. Many cuts and fills were required to traverse the area, and that construction was obvious to us, even with the dense foliage that now covers the area. I recalled, from the walk I took with my father, walking through a large stone culvert, and additionally, that that culvert still had large quantities of ice inside of it, in mid-June. There is every indication that this culvert was part of the original construction of the line. A snippet from an 1870 edition of the Stillwater Gazette, reprinted in John Luecke’s The Northern Pacific in Minnesota, speaks of it. The line continues its climb, with Brown’s Creek 70-80 feet below. This segment is exceedingly beautiful, and will definitely be a highlight of the new trail. As we walked, we noticed many variances in the quality and size of the rail. This was due to much of the rail having arrived through various donations made to the museum over the years. We found several examples of rail that were clearly marked “Great Northern”, which, in absence of the knowledge that the Museum partook in an offer by Burlington Northern to salvage surplus trackage from the formerly vast, former Great Northern Waite Park yards in St. Cloud, could cause an aspiring historian to come to an erroneous conclusion about the line’s origin! Near the top of the climb out of the valley, the line passes underneath Stonebridge Trail, which is named for the stone bridge that crossed Brown’s Creek in this vicinity. This bridge, built around the time of the Civil War, purportedly still stands, but currently stands on private property, and we did not venture off the rail line in search of it. We did see some evidence of the mill that used to exist at this spot; presumably, the new trail will include a marker with some info on that. Finally leaving the valley, the line crosses over the creek on a small bridge with stone abutments, and then skirts the western edge of Oak Glen golf course. The landscape here is nowhere near as shady, and therefore, we found ourselves walking through quite a jungle of weeds. The more we slogged through them, the crazier it seemed. We discussed calling it a day, but, by then we only had a couple miles remaining to get to Tim’s car, so toughing it out was really the only logical option. In the 1980s, the Museum made a deal with the DNR to swap their few hundred feet of property beyond the Gateway Trail for some property adjacent to the trail toward the south. New trackage was then built down along the trail, ending with a passing siding so that engines could run around their trains and pull them back to Stillwater. Some time after the Museum ceased operating on the line, leaving it solely to the Zephyr, this new track was removed, and not much evidence remains of it. End-of-track is therefore now several yards east of Duluth Jct. Completely choked in undergrowth, it is marked with a pink flag on the end of a piece of wire. As we pushed our way out of the bushes and onto the Gateway Trail, we encountered a elderly gentleman out walking a couple of Chihuahuas, who, by the way, didn’t react too kindly to a couple strangers popping out of the woods. We chatted with the guy for a few minutes, dodging the lycra-laden bikers that were humming by. “This trail is the best thing to happen to this area in years,” he said. Indeed, and it’s about to get even better!